The purpose of this three-part series has been to refresh your confidence in your trusted technical indicators. When a trade goes wrong, it is not their fault. Decades of study in the technical analysis field have yielded a wealth of tools to guide the trader, but they were never meant to be the main course. Think of them more as being one of several courses that help deliver a satisfying meal. This thought is embodied in the basic principle of confluence. Seek evidence from multiple sources to increase your odds for success. In the last article, we addressed how to stick with a trend, but what do you do in a range-bound market when it gyrates back and forth? The best advice is to avoid it, especially if you are a beginner. Being whipsawed can ruin your day, and most veteran traders have the scars to prove it. They will tell you that predicting exact reversal points is a losing proposition, no matter how wonderful your trading system may be. Stick with a trending market is the first rule of trading for a good reason. 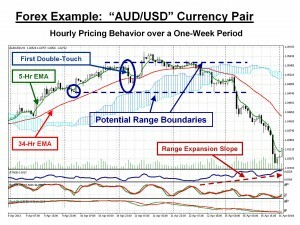 This diagram is a continuation of the chart used in Part 2 where the Aussie Dollar was trending upward. Two Slow Stochastic oscillators helped to signal when the trend was over, but these indicators rarely work when markets are ranging. Instead, a few clever traders came up with the idea to use two moving averages (a 5 and 34 period EMA), along with candlestick formations, to guide their actions in the market. When markets are trending, these two lines (the “green” and “red” lines on the chart) tend to be apart. When the first candlestick (including body, wick and tail) touches both lines, as indicated by the “blue” oval above, then you have your first signal that ranging may begin soon. To determine the potential range boundaries, look backward for candlesticks that formed completely outside of the “double-touch” item’s range. In this case, the upper boundary is the highest previous value, since one did not surpass the reference point. The smaller “blue” circle identifies the potential lower boundary. If you extend the dotted lines, you have a guide for when to expect the ranging conditions to change. In this example, this simple combination was fairly accurate, but let’s not forget our major message about confluence. The ATR slope is now turning positive. The range for each series of candlesticks is expanding, another signal that a breakout from being range-bound is imminent. The prices also penetrated the Kumo Cloud and the moving averages. All that is missing is for prices to break out of the range boundaries, which they soon did. A confluence of a variety of inputs is suggesting that momentum is building. Time to sell the Aussie short and ride the new trend for all it is worth. The trend is your friend! These are words to live by, but also remember to combine indicators for maximum effect and obey the principle of confluence. Happy Trading!